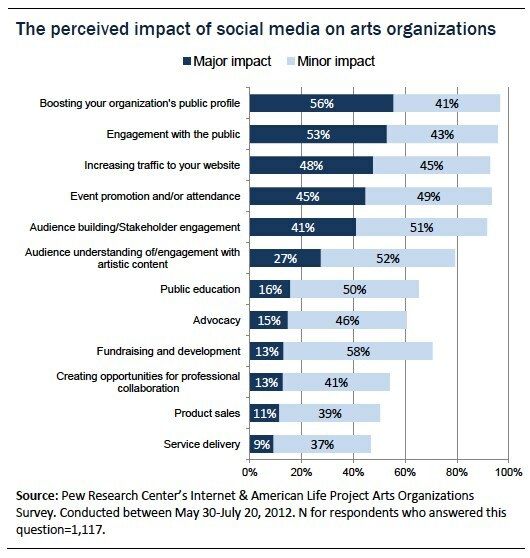 The Pew Internet & American Life Project recently conducted a survey of 1,258 arts organizations (1,155 completed the entire survey) that received funding from the National Endowment for the Arts (NEA) in the years 2007-2011 regarding the role of digital technologies within their organizations. For a brief introduction to the study and findings watch the video below. The report is divided into the following sections: Organizational Technology Use; Website Use; Social Media Use; Technology and Organization Function; and Overall Impact of Technology on the Arts. To download the full report, click here (the PDF is 65 pages and a relatively quick read). I was especially interested in the data regarding social media platforms used, the number of platforms used and the perceived impact social media has on art organizations. Check out the charts below. Facebook, Twitter and YouTube placing 1,2,3 is no surprise. However, I would like to know where Pinterest falls – from what I can tell from my own personal Pinterest research/browsing, arts organizations have really embraced Pinterest as opposed to historical organizations, who are leery of the content/user rights. 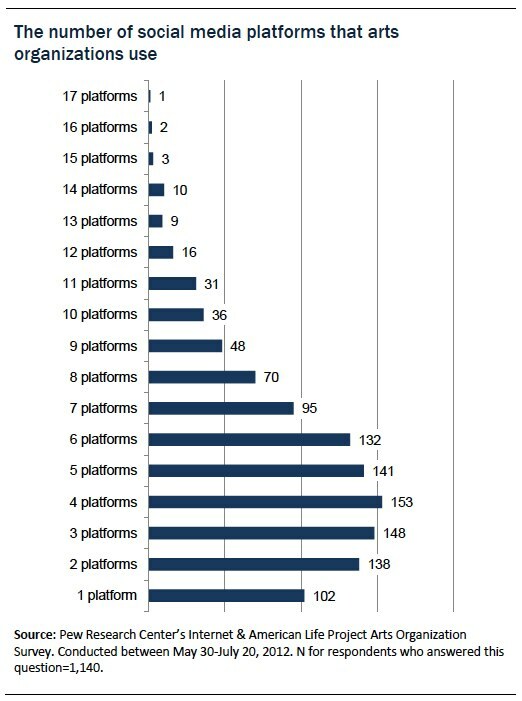 The number of platforms used drops off after six, with four platforms being the sweet spot. Is it safe to assume that those using 3 or 4 platforms are primarily using Facebook, Twitter and YouTube (plus a potential bonus)? How many and which platforms does your institution use? Is there a sweet spot? Can an organization oversaturate the social media landscape? The perceived impact chart provides some great insight. 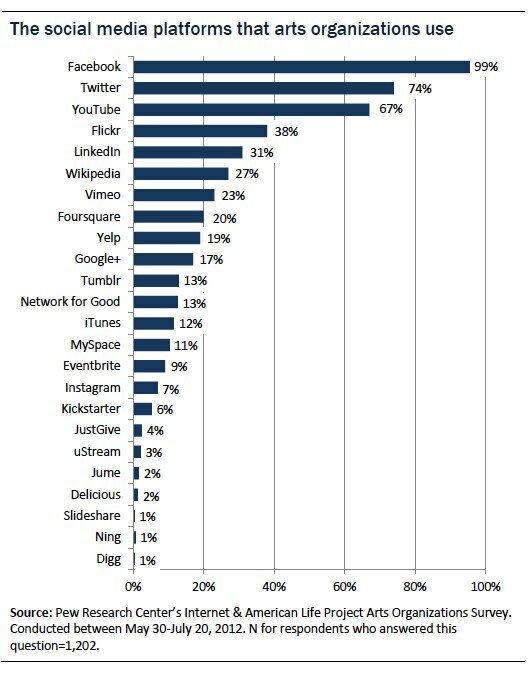 I’m a huge advocate for social media, and it’s because – as this chart shows – social media is not simply a “soapbox”. Don’t get me wrong, it can be (and it does that well-ish) – but, if you’re only using it for promotion you’re missing its full potential. It’s like using a bulky toolbox to hammer a nail instead of opening said toolbox and using the actual hammer – make sense? While the chart above shows major impact for an organization’s public profile, engagement and website traffic – social media platforms have so much more potential to strengthen the impact of an organization’s advocacy, education and development – it’s all about using the right tools, for the right job. Do you agree with the chart above? How has social media impacted your organization, positively or negatively? Do the stats above reflect your organization’s social media engagement? If you have looked at the report, you know that I’ve only scratched the surface. If you haven’t, I highly recommend taking the time the read it yourself – there are some gems in there that may provide some significant insight for you and your own organization. It would be interesting to see similar reports conducted for science centers, zoo, aquariums and history organizations. I wonder if we’d be surprised by the similarities or differences and what that data can teach us about how we can more effectively leverage the true power of social media across our organizations. Tags: Facebook, Groupon, LivingSocial, National Endowment for the Arts, Pew Internet & American Life Project, Pinterest, Social Media, Twitter, YouTube. Bookmark the permalink. Jamie, we use Facebook, WordPress (Blog), and just opened a Flickr account (and of course we have our stand alone website). One thing that I’ve learned (or, at least, that I firmly believe) is that all of these work best when working together. Crosslinking (is that a word?) among these tools seems critical (for instance, our blog would not get half of the readership that it does without being linked from Facebook). Unfortunately, we don’t have a formal plan for the implementation and use of these digital tools–that is a weakness (and opportunity) for us. But, when that plan is developed, the cornerstone will be to remember that these digital tools must service the mission of our historic site–which is largely to educate our public while preserving (and getting as many people as possible to experience) the ‘real’ thing (the real, tangible, object is our ultimate strength). Thanks for another excellent post!! Thanks for your comment, Mark! I agree with you – strategy is key for digital success (& ALL strategy should strive to strengthen the institution & its mission). If you’re looking for a digital planning/strategy resource, Sumo and Inspired by Coffee have put together a FREE digital framework workbook: http://www.digitalengagementframework.com/framework.html. Check it out and let me know what you think!